Second Annual Global Mazda MX-5 Cup Post-Season Event Offers $75,000 to Win, $110,000 Total Prize Pool. Mazda Motorsports today announced open registration for the 2017 Global Mazda MX-5 Cup Challenge featuring a $110,000 prize pool, with $75,000 going to the overall winner. The two-race, total points event will be hosted at Mazda Raceway Laguna Seca on October 12-15. Registration is now open at MazdaMotorsports.com to all racecar drivers around the world, excluding Mazda Motorsports’ factory drivers. 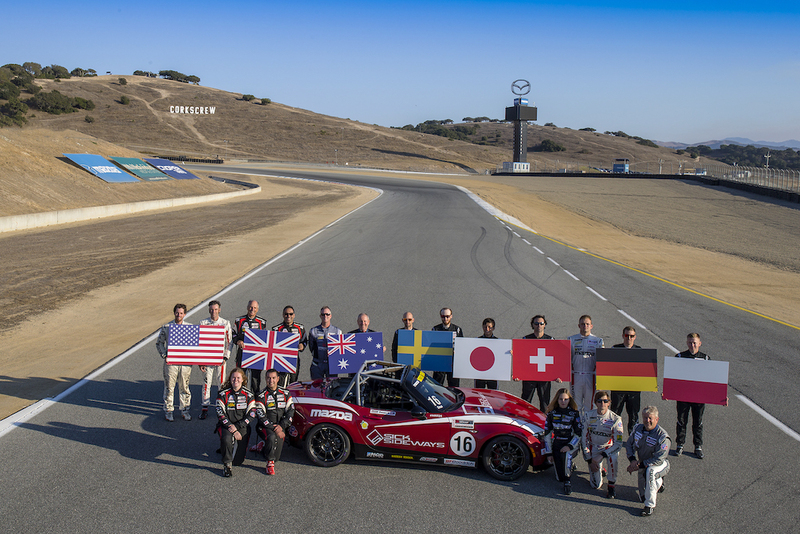 Previously known as the Global Mazda MX-5 Cup Invitational, this high-stakes challenge met success in its inaugural race last year, with 19 racers from the U.S., Japan, Australia, the U.K., Sweden, Poland, Germany and Switzerland competing. It was the first time in the history of professional MX-5 racing that Mazda Motorsports had organized a truly international race for some of sport’s best up-and-coming drivers. Having delivered almost 150 Global Mazda MX-5 Cup cars, there will be ample opportunities for drivers to find or rent a seat to compete for the $75,000 first prize and get a head start on their 2018 season. Racers will need to have an INDYCAR license to compete, as it is the sanctioning body of MX-5 Cup. · Two 45-minute races with points awarded. · Races will be run to the same sporting and technical regulations as regular season MX-5 Cup races. · Interested racers must apply for, and receive approval for, an INDYCAR-issued MX-5 Cup license to compete. All Mazda teams are eligible to enter. Nathanial “Sparky” Sparks added the title of Global Invitational Champion to his racing resume after having just been crowned the 2016 Battery Tender Global Mazda MX-5 Cup presented by BFGoodrich Tires champion. The MX-5 Cup racecars start as complete MX-5 Miata road cars from the Mazda Hiroshima, Japan, factory before being transported to engineering development partner Long Road Racing in Statesville, North Carolina, where they are converted into a race car. The process includes disassembly of the production car, welding and paint of a full roll cage and interior and assembly of the racecar, adding more than 250 motorsports-specific parts. Other components of the car, including the Mazda SKYACTIV-G 2.0-liter engine are sealed to ensure even competition and a cost-effective platform. Mazda Motorsports boasts the most comprehensive auto racing development ladder system of any auto manufacturer in the world. The Mazda Road to 24 program offers a number of scholarships to advance drivers up the sports car racing ladder, beginning with the Global MX-5 Cup series and culminating with the Mazda Prototype team. The Mazda Road to Indy is a similar program that includes Mazda-powered categories of USF2000, Pro Mazda and Indy Lights. In grassroots road racing, more Mazdas race on any given weekend in North America than any other manufacturer. Mazda is also the title sponsor of the renowned Mazda Raceway Laguna Seca in Monterey, California. Follow all of the latest news at MazdaMotorsports.com, @MazdaRacing on Twitter, and MazdaMotorsports on Instagram and Facebook.